Observation - Pigeon at Rest - UK and Ireland. Description: The woodpigeon was observed on a fence in a suburban garden. I believe it to be a woodpigeon, because of the colouring. Particularly the white patch and the hint of white wing patches the eye colour would also, in my view, confirm the identification. 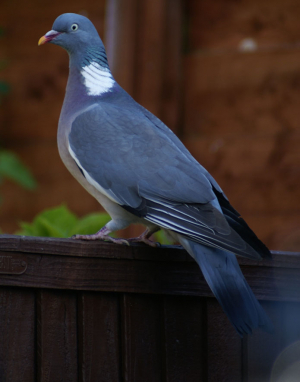 The woodpigeon was observed on a fence in a suburban garden. I believe it to be a woodpigeon, because of the colouring. Particularly the white patch and the hint of white wing patches the eye colour would also, in my view, confirm the identification.